And now we are adding one more Robot in our ‘Robotics Projects’ section, this time we are going to make a Wi-Fi controlled Robot using Arduino and Blynk App. 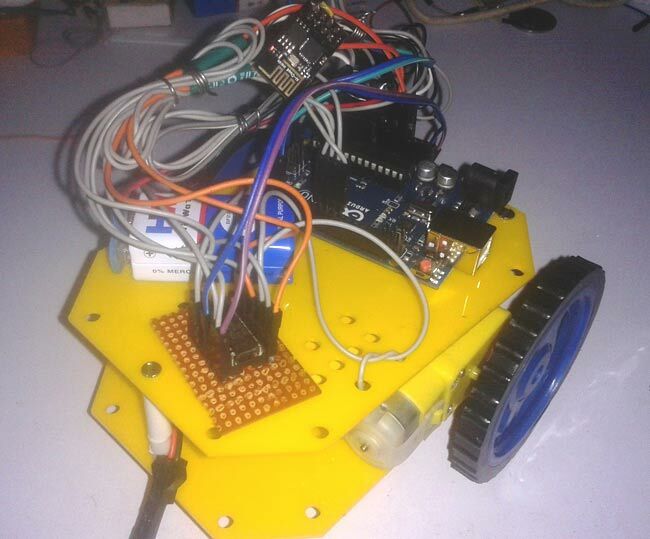 This Arduino based Robot can be controlled wirelessly using any Wi-Fi enabled Android smart phone. For demonstration of Wi-Fi Controlled Robot, we have used an Android Mobile App named “Blynk”. Blynk is a very compatible app with Arduino, to make IoT based project. This App can be downloaded from the Google Play Store, and can be easily configured. 1. First download it from Google Play Store and install it in Android mobile phone. 2. After this, it is required to create an account. You may use your current Gmail account. 3. Now select Arduino Board and give a name for your project. 4. Note down the Auth Token Code or simply mail it to your Email Account and then copy and paste in Arduino sketch (Program Code). 5. Enter this Auth Token Code in Arduino sketch. 6. Then click on create button in Blynk app. 7. Now Select the Joystick Widget, Click on Joystick, Configure the Joystick (see the Video at the end) and hit the back button. 8. After it press Play button at the right top of screen. All this process, of using the Blynk App, has been clearly explained in Video, given in the end. Circuit Diagram of Wi-Fi controlled robot is given below. We mainly need a Arduino and ESP8266 Wi-Fi module. ESP8266’s Vcc and GND pins are directly connected to 3.3V and GND of Arduino and CH_PD is also connected with 3.3V. Tx and Rx pins of ESP8266 are directly connected to pin 2 and 3 of Arduino. Software Serial Library is used to allow serial communication on pin 2 and 3 of Arduino. We have already covered the Interfacing of ESP8266 Wi-Fi module to Arduino in detail. A L293D Motor Driver IC is used for driving DC motors. Input pins of motor driver IC is directly connected to pin 8, 9, 10 and 11 of Arduino. And DC motors are connected at its output pins. Here we have used 9 Volt battery for driving the Circuit and DC motors. Working of the Wi-Fi controlled Robot is very easy, we just need to Drag or Slide the Joystick in the direction, where we want to move the Robot. Like if we want to move the Robot in Forward direction then we need to Drag the Joystick ‘circle’ in Forward direction. Likewise we can move the Robot in Left, Right and Backward direction by Dragging the joystick in respective direction. Now as soon as we release the Joystick, it will come back to centre and Robot stops. Blynk App sends values from Two Axis Joystick to Arduino, through Wi-Fi medium. Arduino receive the values, compare them with predefined values and move the Robot accordingly in that direction. Program is almost readymade available in Arduino IDE. We just need to download Blynk Library for Arduino. And after making some modifications, user can make own Wi-Fi controlled robot. First we have included all the needed libraries to run this code in Arduino IDE, and then entered Auth Token, from the Blynk app, in the auth string. Here we are connecting Wi-Fi serial pin with Software Serial of Arduino. Selected pin 2 as RX and 3 as TX. After this, in setup function we initialise all the required devices, like giving direction to motor pins, begin serial communication, providing Wi-Fi username and password. Now we have checked some conditions for controlling the robot. Here we have selected virtual pin 1 (V1) for taking input from Blynk App to control the robot. As we have used marge option in app so we will get x and y axis values at same pin. At last we need to run blynk function in loop, to run the system. these value used as reference value. if value less or greater than these value, then we takes an action for robot. I have a program for controlling a robot that is 1000 lines of code that runs on a Mega2650. Can I use Blynk to add smartphone inputs to the program? I see there is nothing else running in loop so I'm wondering what else can be done if you use blynk. Thanks. I really appreciate that project you did, infact i'm doing same for my final year project. Can you please help me add the following, i'm having lot of troubles with the libraries and Arduino code. Better use Raspberry Pi for Video streaming, it has dedicated Camera port. Tried to run the code with the BLYNK library latest version v0.4.2 but it said the <ESP8266_SoftSer.h> was missing !!! Tried downloading v0.3.4 but still throwing error !!! Please let me know which library version you all are using and also give me the link where I can download. Check here https://github.com/blynkkk/blynk-library/releases/ and install the library properly, may be you made some mistake while installing it. Can you modify the code for me? I've 4 wheeler , L293D Shield and CC3000 Wifi Shield. What I will do for??? I have same problem like you. Do you have any solutions? Why I cant control it wireless? I can control it while my arduino port is connected to laptop. But when I am changing the source or I transfer the source to battery, I am not able to control it. I think it is because the wifi shield is turning off. having "Failed to disable echo"..why? Tried to run the code with the BLYNK library latest version v0.4.2 but it said the <ESP8266_SoftSer.h> was missing !!! what should i do !!!!? I was reading the L293D datasheet... on the Vcc1 (Pin 16) only 5V supply for internal logic translation and the Vcc2 Power for drivers 4.5 V to 36 V . So from your schematic shouldn't that be PIN 8 and PIN 16 reverse? from where to download the blynksimpleshield_softser.h library ??? In this code the blynk library does not support..
EspSerial haven't declare in this scope error occurs. Arduino: 1.8.1 (Windows 10), Board: "Arduino/Genuino Uno"
bro, how to solve this problem. have you solve it . are deprecated and removed long time ago. wifi esp8266 is continuosly diconnecting .. what is the issue? is it required to use seperate power source for esp8266 module? No such file or directory error. what might be wrong, I have installed latest version library also. Serial monitor displays 'failed to disable echo' and also how to create local server for blynk? Hi. Im doing a project using nodemcu , mdd10a driver and 2 power window motors. i tried the code but whenever i tried to upload it, it says espcomm_failed. could you please help me?